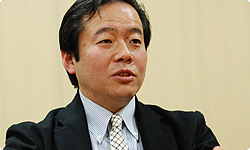 Today I’m going to talk with Miyamoto-san and Konno-san about Nintendogs + Cats. I talked about this game with Konno-san for a live session of “Iwata Asks” on stage at Nintendo World 20111. But since some people couldn’t come to the event at Makuhari Messe or watch the webcast - and I’d like to talk to Miyamoto-san, as well - I’ve gathered the two of you here today. Thank you for coming. 1Nintendo World 2011 Nintendo 3DS Demo: An event held at Makuhari Messe for three days starting January 8, 2011. 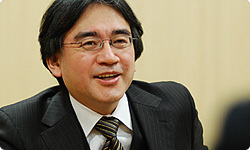 Each day, developers took the stage to present software for the Nintendo 3DS system, and on the final day, Mr Iwata and Mr Konno made a presentation about Nintendogs + Cats. Thank you for inviting us. Since Nintendogs2 came out for the Nintendo DS system six years ago, a lot of people have asked, “One for cats is going to come out next, right?” and “Why hasn’t there been a Nintendogs 2?” Afterward, you never made a sequel to Nintendogs or a game with different animals. Why is that? 2Nintendogs: A game released for enjoying communication with puppies. It was released for the Nintendo DS system in April 2005 in Japan. After Nintendogs was complete, we wondered how cats would work out and experimented by converting the dog model to a cat. There were even ideas for animals like horses and dolphins. Some people said that horses would definitely sell well in Europe. So you were thinking about it, experimenting, and discussing it. Fate just wasn’t with those experiments and you weren’t able to find that key element to validate them as a product. Yes. We actually considered it for the Wii system. But it doesn’t have a microphone, so you couldn’t talk to your dog. Oh! So if the Wii Remote had had a mic, there might have been a Wii version of Nintendogs? Yes. We might have moved forward with it. But there’s a distance between the Wii Remote and the television, so it might not have felt like you were petting your dog. Right. We decided to consider any good ideas that might come up, but nothing ever developed. And to be honest, I didn’t feel like making a follow-up to Nintendogs at the time. I wonder if it’s motivation that brings in fate. The motivation for making the first Nintendogs was when you first got a dog, but even if you could imagine a game with other animals, you didn’t feel like making one. Right. I thought dogs were special at the time. Besides, I thought if cats followed dogs, it just wouldn’t be like Nintendo. Yes. We talked about that often. If we do things that are easily predictable, we won't be able to surprise people. 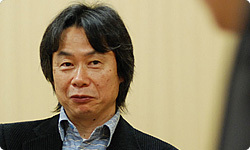 But then Miyamoto-san said he got a cat and you could tell that everyone who was interested in Nintendo was waiting for a game called Nintencats to appear next. Miyamoto-san, first you had a dog, and then a cat, and ended up having both at the same time. Did you observe how they got along and the differences between them? Yes, that’s right. I had heard a lot about what cats are like, and I thought having one would be difficult, but luckily my dog got along well with the new arrival. Maybe he viewed it as his own child. The older dog treated the new kitten like its own child. Right. That was lucky. My cat was really tiny, so perhaps it viewed my dog like a parent, and they got along right away. I hear there are homes where the dog and cat get along and others where they don’t. Yeah. In some homes, they won’t even look at each other. When I see my two pets getting along so well, there are all sorts of pretty pictures. For example, my dog will be padding along with the cat padding along behind it, or their silhouettes will be lined up before the evening sun. It made me think of The Incredible Journey3, a Disney film I had seen as a child. It’s about two dogs and a cat who go on a journey to return to their owners after their owners leave on a trip and entrust them to a friend. It was quite moving. (laughs) 3The Incredible Journey: A movie based on a bestselling novel in Canada and released in 1963. In 1993, a remake titled Homeward Bound: The Incredible Journey was released. I thought how pleasing it would be if you could see a dog and cat getting along well in a game. But what if your cat hadn’t got along with your dog? I suppose I’d have made the game just based on my imagination, or the game might not have come out at all. So it probably wouldn’t have turned out the way it did. Right. Making a game called Nintencats just didn’t seem right for Nintendo, but people all over the world love cats, so I wanted to put cats in a game somehow. But when I actually got a cat, I realised there just aren’t as many things to do with a cat as there are with a dog, that we may use in our entertainment. I concluded that showing how dogs and cats interact would be just right. Before you discussed this idea with Konno-san, did you already have your mind made up about the direction this new game would take? Yes. That’s why I said I definitely wanted to make it a Nintendogs game. With dogs as the main element. The title Nintendogs + Cats simply followed. I even wanted to make the word “cats” smaller than “nintendogs” . It had to be “+ cats” - like they come second. I wanted to make it so the cat suddenly shows up, embellishing your life together with your dog. But there were some big cat lovers on the development staff, and they said we should treat them equally. Treat the dogs and cats equally? When we actually started making it, dogs and cats were completely different from each other, even though they both walk on four legs, and I started thinking we would have to make something completely different. Cats were tougher than you expected. Exactly. They’re a most formidable animal!